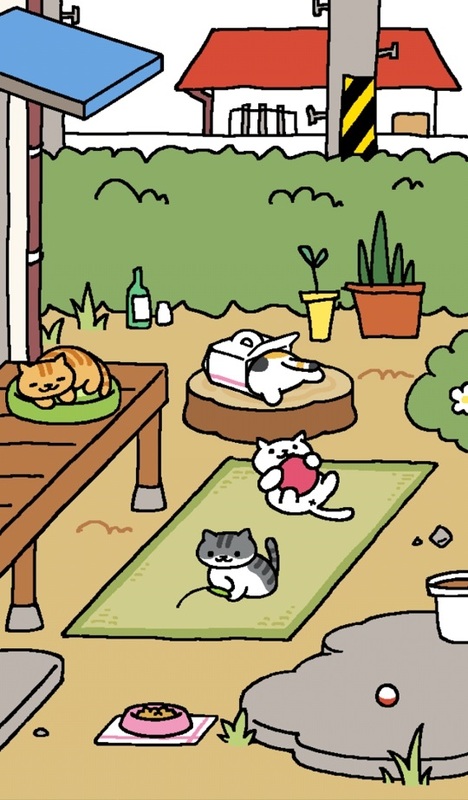 There is a new (not really new, but it has just been translated from Japanese to English) game for Android and iOS based phones, Neko Atsume: Kitty Collector, where your only task is to collect kitties. Yes, that's right! You don't have to worry anymore about adopting too many cats, and what it says about your mental health if you do! The game is quite simple: You have a yard (and later a part of your house) where you put out food and other goodies for cats, and just sit back and wait until they visit you. As a thank-you, they will leave you fish, which you can use to buy more goodies. Don't worry, you won't have to spend a lot of precious reading time with the game; actually, it requires you to close the app and leave it alone for some time in order for new cats to appear. It is so unbelievably relaxing! The artwork is pretty simple, but absolutely cute. At first I thought this would perhaps be a bit too plain, but when I had three cats in my yard for the first time, I went *SQUEEEEE* and now I'm hooked. And now for the best part: The game is free. There is the option to buy more fish with real money, but you'll only want to resort to that if you're really impatient - and let's be honest: if you're that impatient, this game is not for you. You can get the Android version at the Google Play Store and the iOS version at the Apple Store. Now, if you'll excuse me, I have to go and look if Tubbs has eaten all the food again.